Heath Church has been involved in Bible translation ever since Klaus and Janice Spreda joined the Wycliffe Bible Translators (WBT) and left for Nigeria in 1963. Janice Backler, as she was, had trained and worked as a district nurse in Cardiff when she felt God’s call, while Rev W J Sharman was the pastor. She trained for missionary work at the Bible Training Institute at Glasgow, where she met Klaus, from Germany. Their very first assignment was as staff on a training course in linguistics for Nigerian and expatriate translators before four months in Ghana for ‘field training’. Then Klaus was assistant to the director for the first year, among other things accompanying him on surveys to language groups being considered for Bible Translation. Janice did book-keeping among other things. They lived in Enugu, (the capital of the East State at that time) where they found a suitable house for a centre and set it up. After a year in Nigeria, they were allocated to the Agbo people in Cross River State in the south east of the country and they began the long task of analyzing Legbo, their local language. They produced an alphabet and the first pedagogical material to teach the reading and writing of the language, and began the analysis of the grammar. As a consequence, Klaus was asked to take over the administration in Germany, and he taught at the new linguistics training course in a small village in Germany, called Holzhausen. Later he became director of that course which became known as the Seminar für Sprachmethodik (SSm). He was also recommended to engage in university studies for PhD research. Klaus and Janice also worked for many years from 1969 in the leadership of the Seminar für Sprachmethodik. In 1972, Klaus and Janice were re-assigned to the Cameroon branch of the Wycliffe Bible Translators and agreed to begin work among the Metta people in the North-West Province of the country. The story of their work among them is briefly recounted in the Metta Story. The present pastor of the church, Rev Wyn Hughes, visited the Metta project in November 2007. 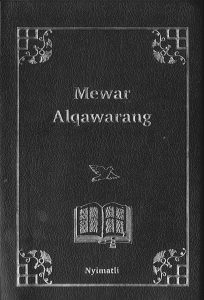 The whole New Testament has now been produced and was launched at a special ceremony in Mbengwi on 1 March 2014 (see Metta Project). See Follow-up visit. In the meantime, Klaus-Peter and Doris Kügler, also from Germany, joined the Heath Church in 1971 as associate members, and went the following year to Nepal, with the Summer Institute of Linguistics (SIL), to begin a similar work among the Danuwar Rai people in the Terai region in the south of the country, close to the border with India. However, in 1976, SIL was forced to close down there because of pressure from the leading caste while the king was visiting abroad. However by that time, they had worked out an alphabet for their language, prepared an elementary dictionary, and had translated Luke’s Gospel and the early chapters of Genesis. A church of about 200 Danuwar Rai believers in a number of villages had been established through a remarkable work of the Holy Spirit, which had began while Klaus-Peter and Doris were out of the country. Despite early, and intensive, persecution, those believers have remained faithful and solid, and the churches continue today, even though they are quite poor. There are in fact two Danuwar Rai churches in the capital city, Kathmandu; one of them is pastored by Thomas Rai with whom Klaus-Peter is in regular contact, with many requests to visit them. In February 2010 Klaus-Peter had the opportunity of visiting Nepal and the Danuwar Rai believers and was astonished at the huge spread of the Gospel among the people.you can You can read his report here. In 1978, Klaus-Peter and Doris Kügler were re-assigned to the Indonesia branch of the Wycliffe Bible Translators. On the very day they left Germany for Indonesia, a group of people known as the Fayu were discovered in the interior of Irian Jaya Province (now known as Papua), and they believed that this was God’s leading that they should be allocated to them. They began their first tentative steps in the work the following year, and as mutual confidence began to develop, they moved to a settlement known as Foida on the Klihi River which flows into the Memberano. The story of family life there is vividly described by their daughter Sabine in a book called Jungle Child, which is available through Heath Christian Bookshop. By 2009, when Klaus-Peter formally retired from Fayu mission work, a number of congregations of believers had been established, with local leadership, aided by an Indonesian mission, the YPPM. Clinic facilities and a first school had also been established by Doris. Klaus-Peter and his Fayu friend, Nakire, translated some key verses from the Bible, but now YPPM and another Indonesian mission, the YBI, have decided to engage in more translation. However, in order for that to happen they have realized that they need a linguist to be allocated to the Fayu to do more analysis of the language itself. A young American missionary has felt called by God to undertake that analysis; he has learnt the national language and is now spending time among the Fayu people learning their language and culture. He has now established a team of translators who participate in a programme called One Story; they are translating a series of Bible narratives, getting them checked for comprehension and rehearsing them to share them with Fayu people in their villages. Paul Tench, an elder at Heath Church, has been involved in a professional capacity with alphabet workshops, a necessary precursor to written translation, with The Seed Company, an offshoot of the Wycliffe Bible Translators. He first helped to develop an alphabet for the Tera people of Gombe State in North East Nigeria, and then worked on the alphabet of three other languages in that part of Nigeria, and the Etkywen/Ichen language of Taraba State in the east. The Tera translation team completed the whole New Testament in 2016 and published it in 2017. Their name in their own language is Nyamtali. 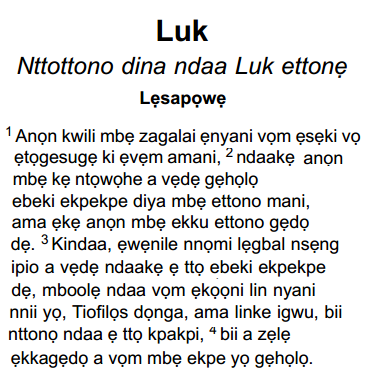 Three other translation teams have managed to complete their translation of Luke’s Gospel, and hope to publish it as soon as they complete the final editing process with their consultants. The Boi language development team have just begun that process with a recommended spelling system. In 2011, he paid two visits to Zambia, again at the invitation of the Seed Company, to help prepare alphabets for the Fwe, Kwamashi, Kwangwa and Makoma people, and then to work with the Shanjo people on their spelling system. 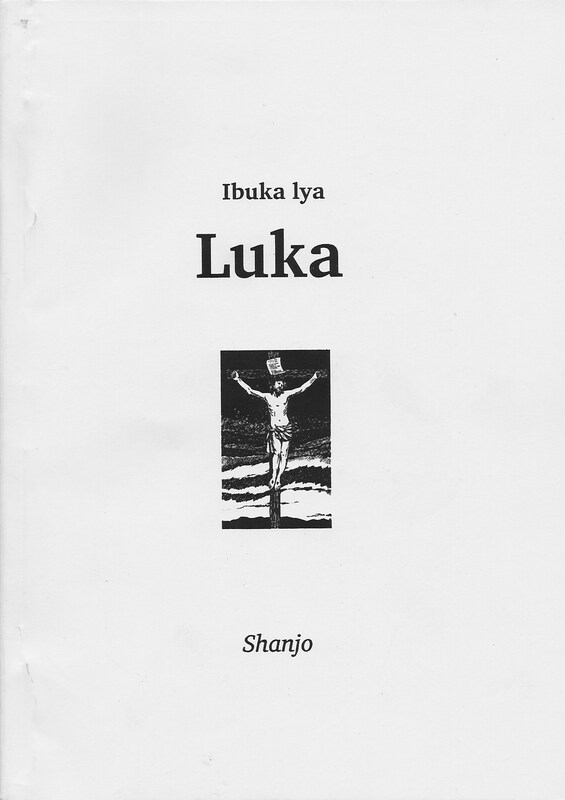 The Shanjo translation team have now completed the whole of Luke’s Gospel; their translation consultant wrote: “I am very pleased with their fine work. They have just read the whole book through aloud as a naturalness check and worked hard on the key terms to make sure they are appropriate for each context.” They are now working on Matthew, Mark, Acts and James. Heath Church is also in touch with Bertram Gayle, who studied at WEST, Bryntirion, Bridgend; he joined the Caribbean branch of Wycliffe Bible Translators and has been assigned to the Jamaican Creole project. Up to date news from him is available at www.bertramgayle.blogspot.com or bertram_gayle@wycliffe.org. Heath Church is also involved with a project in East Asia.